Home » Cats » Waking up. Ah those teeth – vicious little things, and a surprise every time. He just shows love in his own special way. I knew I closed my bedroom door for a reason. You should get a dog to keep the cat in line. I got a dog a few years ago, not to keep the cat in line but because of some misguided desire for a dog. Cat hates dog and dog hates cat. The symmetry of the whole thing is beautiful. 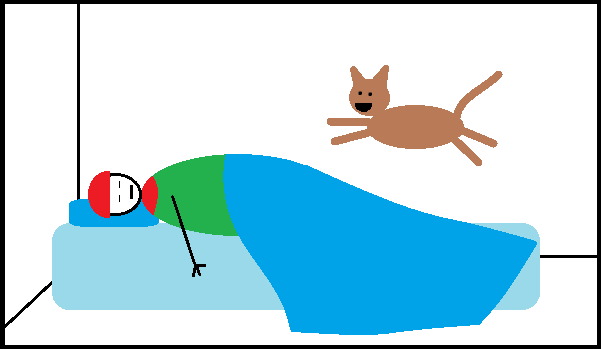 However, I now have a cat and dog both sleeping on the bed, so maybe this wouldn’t work well for you, but the cat doesn’t wake me up anymore. This sounds like one of those awesome plans that would inevitably backfire – like my plan to get a dragon. In actual fact, I’m fairly sure that a dog wouldn’t last the night around my death eater cat. I <3 him.